We don't know much about the Johnsons. There was more than one family. M. B. & Eva (Lenora) Johnson had a large and extended family. There were also some children of Elijah and Lydia Johnson (buried in Pawnee City). There was also a Rev. Johnson who was minister at the Methodist Church for a while. Any helpful information in getting this page organized would be welcomed. Contact us at TableRockHistory@gmail.com. August 2, 1900, M.B. 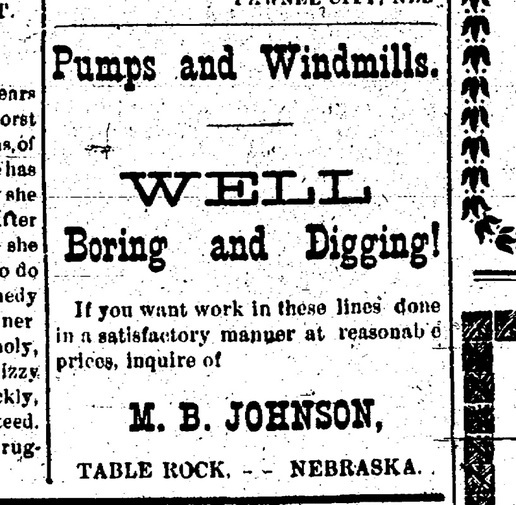 Johnson, Pumps and Windmills, Boring and Digging. August 10, 1911 - Joseph Lyman Johnson at son Lester Johnson's home southwest of Table Rock. He came to Table Rock in 1871, lost his wife Eliza in 1872, married Emma Comstock in 1879 (she died in 1907), and had a number of children. 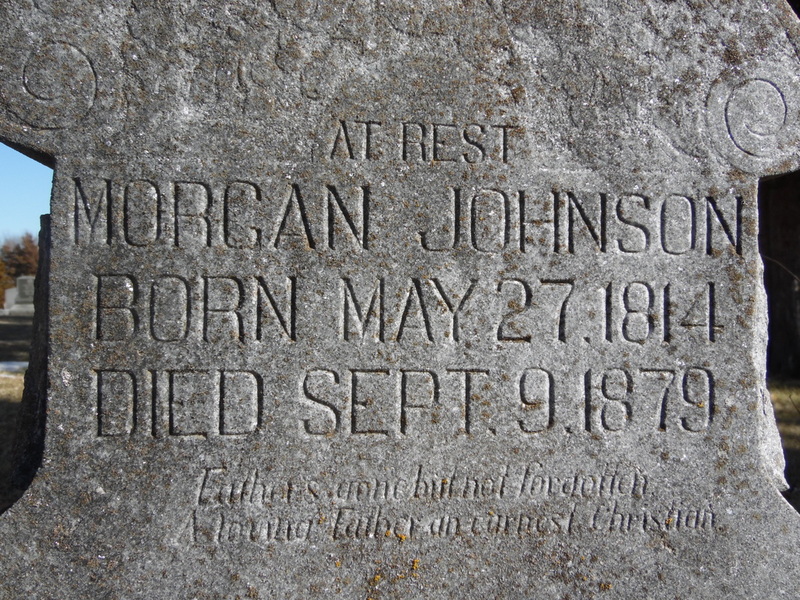 Little Sidney Johnson dies of tubercular meningitis. Sidney was ​a son of M. B. and Lenora (Matthews) Johnson and sibling of Flossie Alwilda, Ralph Leon, Ernest Edmond, Jay Bryan, Alonza, Theresa May, Bernice and David Byran Johnson. Tombstone of Sidney & Flossie Johnson, children of M. B. & Lenora Johnson. Flossie was six when Sidney died, and herself died five years later at the age of 11, in 1918. The marker appears to be a small purchased stone imbedded in a homemade concrete base decorated with stones. The little four year old son of Mr. and Mrs. M. B. Johnson's is still in a very critical condition. Last week Drs. 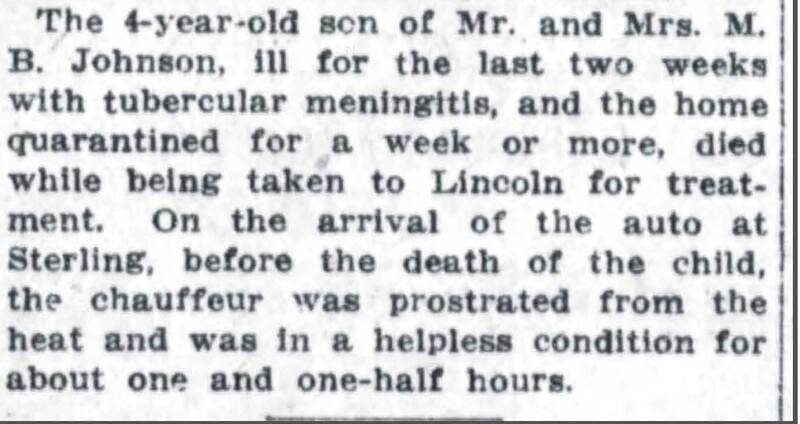 Gandy and Novak of Humboldt were called in consultation with Dr. Cherry and pronounced the case Tubercular Meningitis. And in the August 15, 1913 Argus: . Sidney Raymond, son of Mr. and Mrs. M. B. Johnson, was born March 1, 1909, died August 5, 1913, aged 4 years, 5 months and 4 days. That death loves a shining mark, received a new verification in the death of this beautiful little boy. The best medical skill and the careful nursing of a loving father and mother was of know avail, and death claimed the promising child, as he has millions of others in the years gone by. The funeral service was conducted at the Johnson home by Rev. Wimberly, Rev. Young assisting, on Wednesday, August 5, at 4 P.M. Many friends and relatives were present and sympathized deeply with the heart broken father, mother, brothers and sisters in their unspeakable loss. It is well with the with your precious little boy. 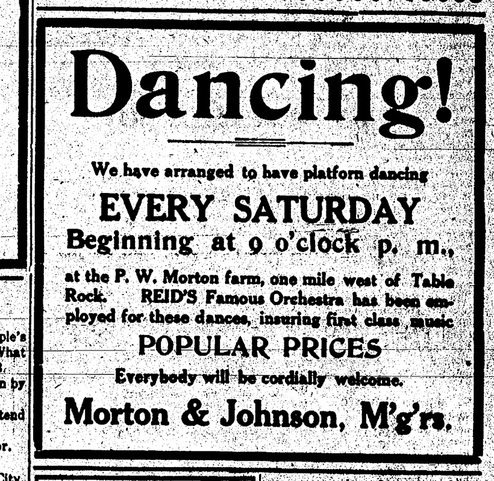 April 12, 1918 - Dancing at the Morton Farm every Saturday! Managers: Morton & Johnson. Flossie Alwilda Johnson was born near Table Rock, August 1, 1907 and died at the hospital in Pawnee City, August 29, 1918, a brief life of eleven years and 28 days, yet one filled with joy for herself and good cheer for her family and friends. A little brother departed this life five years before her in the same month- August. She leaves a father, mother, five brothers and two sisters: Ralph Leon, Ernest Edmond, Joy Bryan, Alonza, Theresa May, Bernice and David Bryan. ​The funeral services were held at the Presbyterian church on Sunday afternoon, conducted by Dr. Joseph B. Cherry and assisted by Rev. S. E. Taft. A large concourse of friends being present to pay tribute to her memory. The sympathy of the community is extended to the bereaved parents, brothers and sisters and other relatives of the deceased. Just as the influenza pandemic is getting ready to slam Table Rock, 50-year-old M. B. Johnson (1868-1953) was running for county sheriff. This ad appeared the week before public gatherings were abruptly banned. M. B. in later years. Photo 3159, M. B. 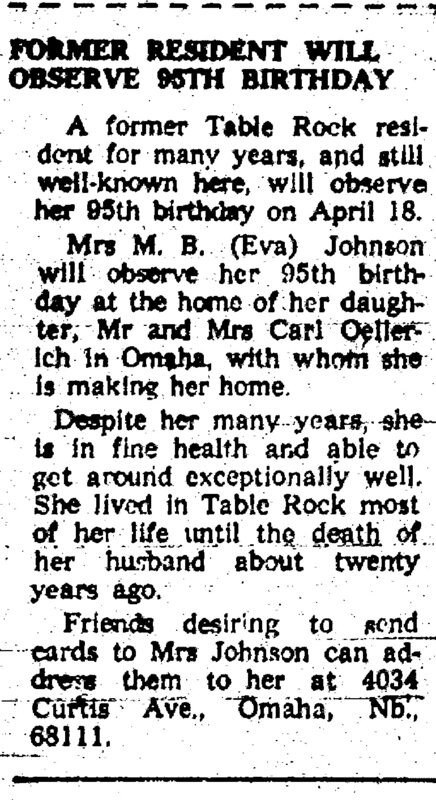 & wife Eva (also called Leonora), shared by Clyde Oellerich. April 17, 1925 - the widow of Rev. P. C. Johnson dies. Her husband had been Methodist minister in Table Rock for several years, and during that time, their daughter married B. F. Norris, one of the children of Fannie & Chauncey Norris, who lived on the same block as the church. Clara Scism and Dorothy Phillips of Table Rock attended the funeral -- they were both Norris family members. Photo 308 includes David Johnson, bottom row, second from right. 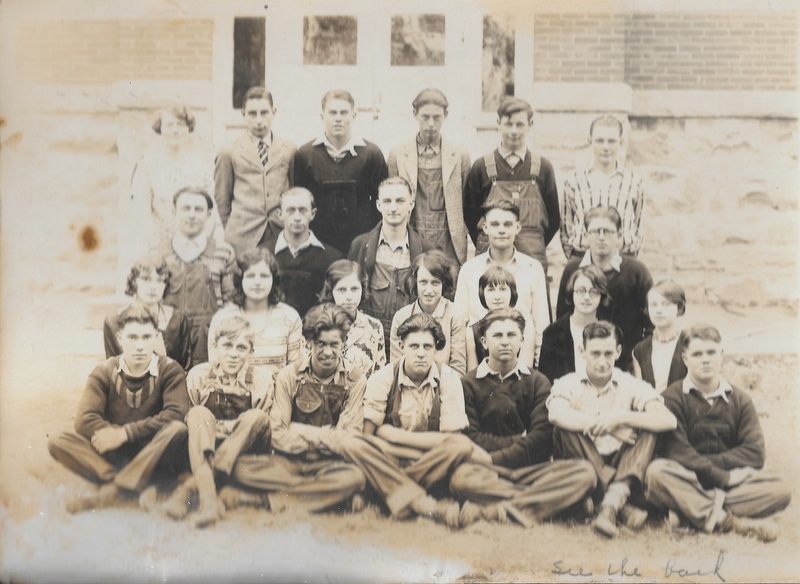 This the Junior Class in the Fall of 1929 taken by Mary Snabl Sturgeon (Class of 1932). The persons here are: Teacher Ruth Goodrich Tomek (Mrs. John Tomek), Alvah Aylor, Kenneth Bain, Albert Allguier, Dale Townsend, Roy Hanna; Jim Nedved, Loyd Jasa, John W. Tomek, Elza Morton, Cyril (Purdew? ); (Paul?) McGinnis, (Earl?) McKnight, _____ Jones, Lorraine Hunzeker, Arnold Zelenka, David Johnson, and Arnold Phillips. Photo 806. Teacher Homer Johnson is in the middle in this photograph taken in 1930 or 1931 by Mary Snable Sturgeon, Class of 1932. The people in the photo: Louise Smidt, Melba Durst, Homer Johnson, Gladys Stanley, and Helen Bain. 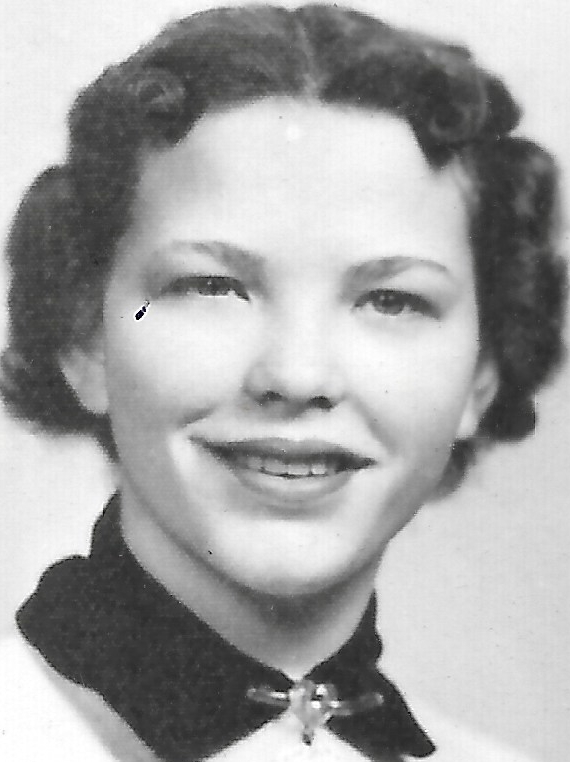 M. B. JOHNSON, 84, DIES SATURDAY AT PAWNEE HOSPITAL; BURIED TODAY. One of Table Rock's oldest citizens was laid to rest this afternoon, as a large crowd of relatives and friends paid their last respects at the funeral of M. B. Johnson. Mr. Johnson died Saturday afternoon at the Pawnee County Hospital. "M.B. ", as he was known by all his friends in this community, had recently been admitted to the hospital following a heart attack. He passed away Saturday at the age of almost 85 years. Funeral services were held in the Kovanda-Beethe Chapel in Table Rock, with Rev. B. F. Parnell conducting the final rites. Interment was made in the Table Rock cemetery. Mr. Johnson was in a number of businesses in Table Rock during his 43 years residence here. At one time he operated a theater, a feed mill, a drayage business and a pump shop Mr. and Mrs. Johnson would have been married 62 years on March 8th. Pallbearers were Fred Jelinek, Arthur Mertes, Lloyd Jasa, Alvah Aylor, Howard Herrick and Lester Harris. Mr. and Mrs. M. C. Bonham sang duet numbers accompanied by Mrs. C. W. Covault at the piano. M. B. Johnson was born April 5, 1868, at Bronson, Michigan, the son of George B. and Mary Straight Johnson, early Nebraska pioneers, and passed away on Saturday, February 21, 1953 at the Memorial Hospital in Pawnee City, Nebraska, having reached the age of 84 years, 10 months and 16 days. On March 8, 1891, he was united in marriage to Lenora E. Matthews at Shelby, Michigan. They came to Nebraska in 1891 where they resided continuously since then, except for two years spent near Edgerton, Michigan. They moved to Table Rock in 1909 where they lived to the date of his passing. Mr. Johnson is survived by his wife, Lenora; five sons, Jay, Leon, Ernest, David and Alonzo, all residents of the states of Washington and Oregon; two daughters, Mrs. Mae Sailors of Lincoln, Nebr., and Mrs. Bernice Oellerich of Omaha, Nebr. 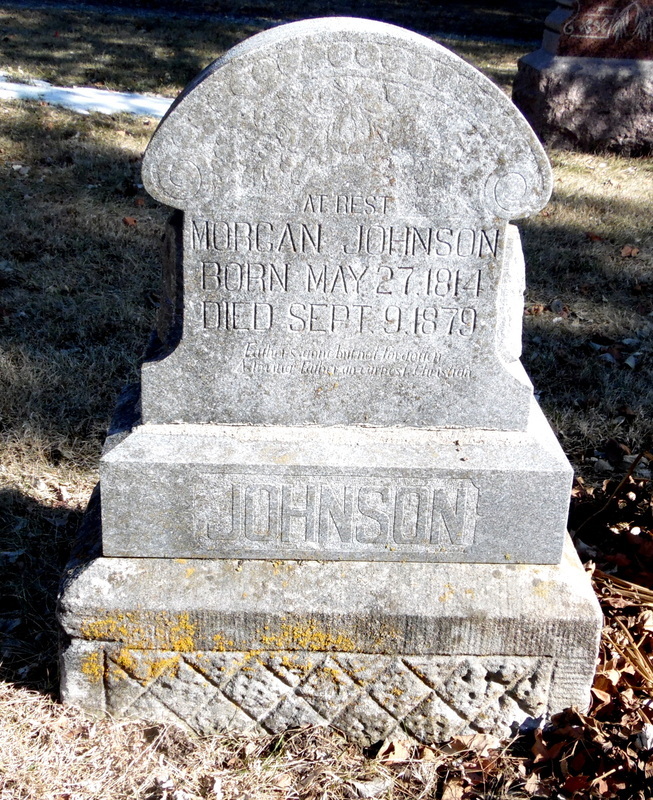 He is survived by two brothers, Frank A. Johnson of Tecumseh and Andrew E. Johnson of Lincoln. 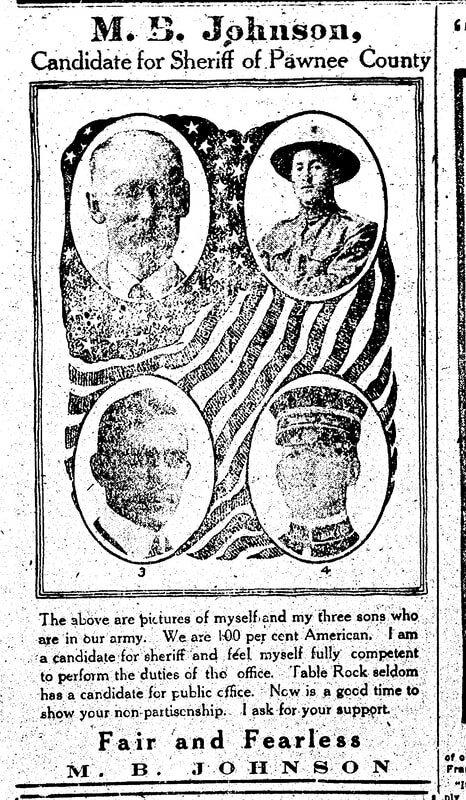 He also leaves three sisters, Mrs. Eva Linn, Mrs. William Burrow, and Mrs. John Pattison, all of Table Rock. M. B. Johnson was a good man, of clean habits and honest. He will be greatly missed by his loved ones and friends. Class of 1955 - Lucy Johnson and Keith Johnson (excerpts from Photo 54). According to FindaGrave.com, 27 Johnsons are buried in the Table Rock Cemetery, if include Johnson as a maiden name. These are just a few of the tombstones. His wife Abigail is not buried here. Perhaps he came with his son George. George and his wife Mary came to Table Rock from Michigan in 1869 or 1870, a "few" years thereafter returned to Michigan for a year, and then came back to Table Rock. Perhaps he returned with them after the death of his wife, but Findagrave reveals no memorial that would seem to be his wife, at least not yet. His Findagrave memorial bears unsourced information that he married Abigail Houxsie and they had seven children. His son George is buried in the Table Rock Cemetery; the whereabouts of the others is unknown. ​andrew, ralph, & charles b. Table Rock Argus, Mar. 16, 1905. 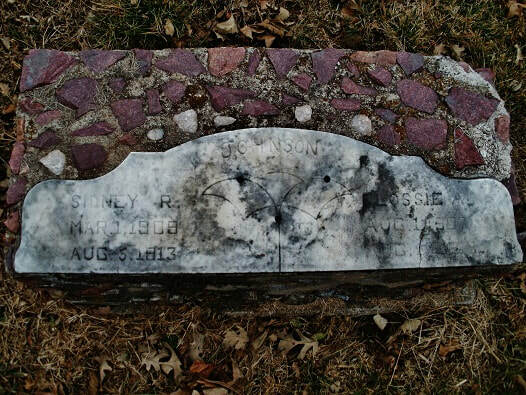 Mary Teressa Strate was born September 20, 1850, at Cambridge, Henry county, Illinois, and died March 9, 1905, at her home south of Table Rock, aged 54 years, 5 months and 15 days. From Cambridge her parents moved to Fremont, Indiana where both parents died when she was six years old. She was then adopted by Michael Blass of Bronson, Michigan. On April 22, 1866 she was united in marriage to G. B. Johnson. In 1870 they moved to Nebraska, near Table Rock. A few years later they returned to Michigan, staying about one year, and then came back to Nebraska, where they have since resided; their present home being about one and one-half mile south of Table Rock. Nine children were born to them- six boys and three girls. 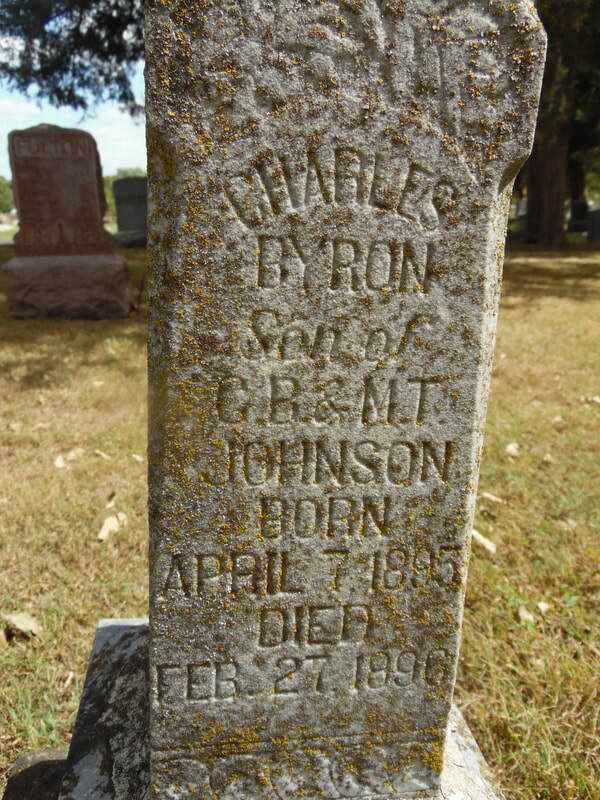 The two youngest boys, Ralph and Charlie, died in early childhood and are buried in the Table Rock cemetery. Of the remaining children, five are married, the oldest, M.B., now living near Grand Rapids, Mich.; Frank a. Johnson, Mrs. Eva Linn, Mrs. Myrta Pattison and Mrs. Vena Burow, all living in or near this city. Natie and Eddie, together with their father, were at home at the time of their mother's death. She united and was baptized into the Christian church in 1896, and was also a member of the W.C.T.U. of this city at the time of her death and was anxious to see every good cause advanced. Her death was very sudden and unexpected. While she has not been in good health for several years, and was under the doctor's care the last few months, not even those dearest to her were prepared for the sudden taking away of the wife and mother. While she has gained a home in heaven those who are left behind mourn the loss of a faithful wife and loving mother. The funeral services were held in the Christian church at 3 o'clock Sunday afternoon, conducted by Elder T. A. Lundenmyer, pastor of the Christian church of Pawnee City, and a vast concourse of friends being present to pay the last tribute of respect to the memory of the deceased. Table Rock Argus, Oct. 17, 1919. G. B. Johnson, for many years a resident of Table Rock, died at 2 a.m., on Saturday morning. For a half century he toiled as a pioneer in the development of Pawnee county, under-going the hardships and privation incident to pioneer life with courage and hope, believing that out of his toil and the burden would come reward, and he lived to see many of his hopes realized. 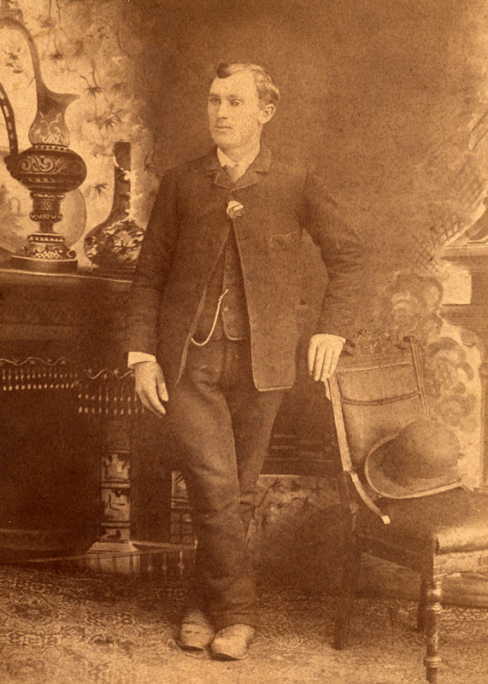 For several years he has been largely interested in farming near Bird City, Kansas, and it was while there that he received the injury which terminated in his death. While not in good health he went out a few weeks ago to look after his farm interests, and fell and broke one of his legs and sustained other injuries which aggravated his stomach trouble. His sons, Edwin and M. B. brought him home. He was taken to the home of his daughter, Mrs. Charles Linn, where he was given every care possible, but he passed away as above stated. Funeral services were held at the Christian church on Tuesday afternoon at 2 o'clock, conducted by the pastor, A. A. Beldon, old time neighbors and friends acting as pallbearers. To the surviving children goes out the sympathy of all who knew him. 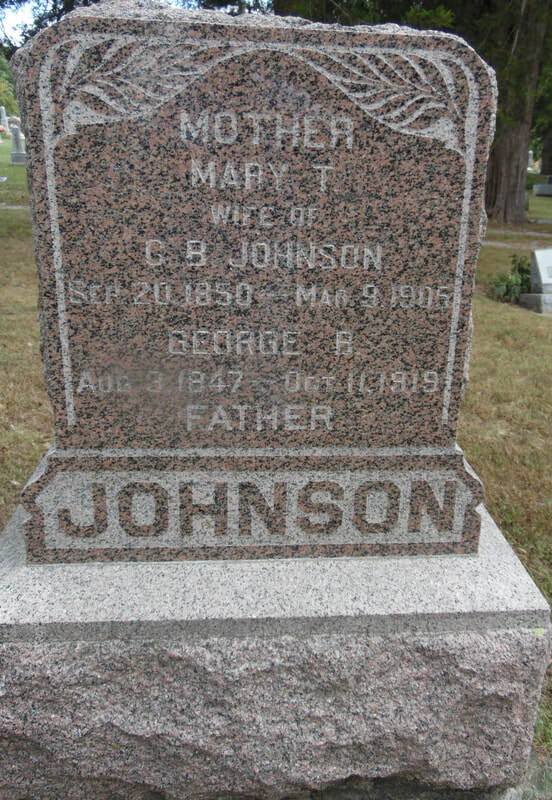 George Byron Johnson was born August 3, 1847, in Bronson, Branch county, Michigan. He passed away at the home of his daughter, Mrs. Charles Linn October 11, 1919, aged 72 years, 2 months and 8 days. He was united in marriage to Mary Theresa Straight in 1866 in the county where he was born. To this union were born nine children, six boys and three girls. In 1869 they moved to Nebraska, where they lived in and about Table Rock most of the time until they passed away. In 1897 he joined the Christian church. Two children, Ralph Dell and Charles Byron, passed away in infancy. The other children were all at his bedside at the time of his death. M. B., Frank Albert, Andrew Edwin, pf Table Rock, Nebr., Nathan Alonzo of Dunning, Nebr., and Mrs. Eva Linn, Mrs. Myrta Pattison and Mrs. Vena Burow, of Table Rock, Nebr., survive. He has one sister, Mrs. Alvira Secor, of Bronson, Michigan, who came to be with him at the last, but arrived too late to see him alive. He was the grand-parent of twenty-nine grandchildren, twenty-six of these surviving. Besides these relatives he leaves many friend to mourn his departure from this life.